I am really glad I chose this fan and happy with its performance. Have recommended this product to all my friends and neighbors. My husband loves it because it really works well. 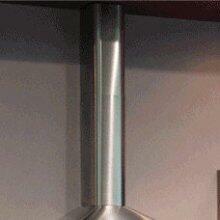 We have now placed this range hood and used it often. Like the look from the pictures available and cannot beat the price. Arrived on time, easy installation, looks great in kitchen. This is honestly such a great product for the price. Even before the rebate deals on AppliancesConnection.com, I was surprised to find such an effective Faber range hood going for this low. It's very quiet and that's what we wanted. Looks fantastic and works great. Nice solid filters that never have to be replaced. You know what’s a great feeling? Not setting off the smoke alarm every time I use my cast-iron skillet. Get a Faber range hood. You will not regret it. The fan works nice and isn't too loud. Easy to install, and was a perfect size for the kitchen. I'll buy the same thing again if I ever need one.